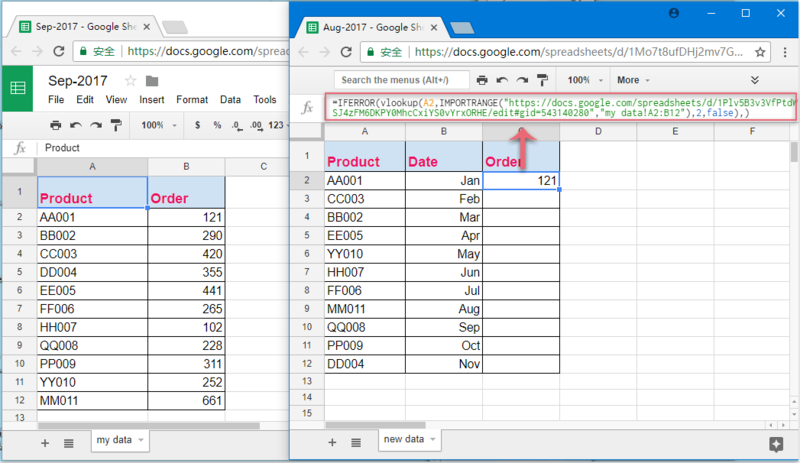 Comment vlookup valeur correspondant à partir d'une autre feuille de google? Supposons que vous ayez suivi deux fichiers de feuille google, maintenant, vous devez rechercher la valeur correspondante dans un fichier d'un autre, avez-vous de bonnes solutions pour le terminer? 1. 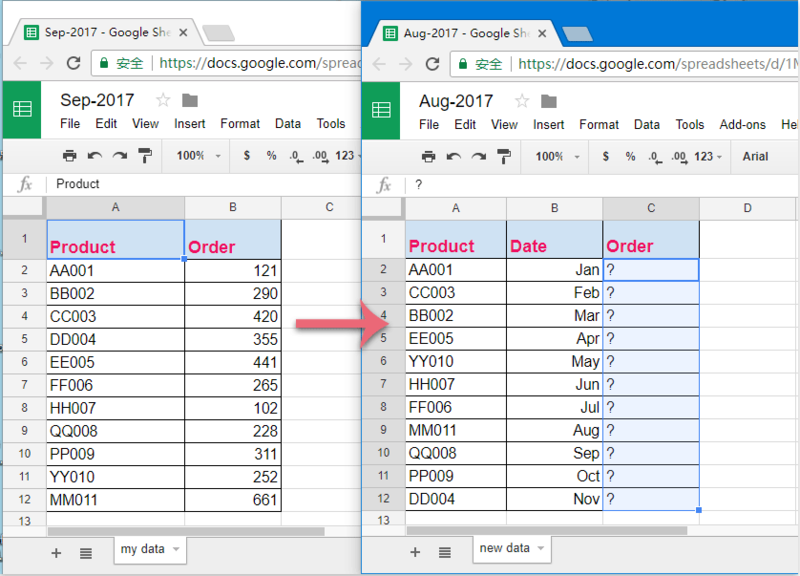 Entrez cette formule: =IFERROR(vlookup(AXNUMX,IMPORTRANGE("https://docs.google.com/spreadsheets/d/XNUMXPlvXNUMXBXNUMXvXNUMXVfPtdWSJXNUMXzFMXNUMXDKPYXNUMXMhcCxiYSXNUMXvYrxORHE/edit#gid=XNUMX","my data!AXNUMX:BXNUMX"),XNUMX,false),) dans une cellule vide où vous voulez rechercher la valeur correspondante. 2: indique le numéro de colonne que votre valeur correspondante est renvoyée. Thanks for this! However, this is only working on about half of my items. I have copied the text exactly as it appears and made sure the format type is the same as well. About half of my data is being found, while the other half is empty (due to the iferror formula). has anyone else found this or have a solution? Can someone help please. I am getting #N/A as a result. I have even tried to put in the importrange formula in a blank cell but still no luck. I have also tried using the LINK SHARE url instead of the actual URL. getting blank cell as result. Have you granted access for "importrange" part? 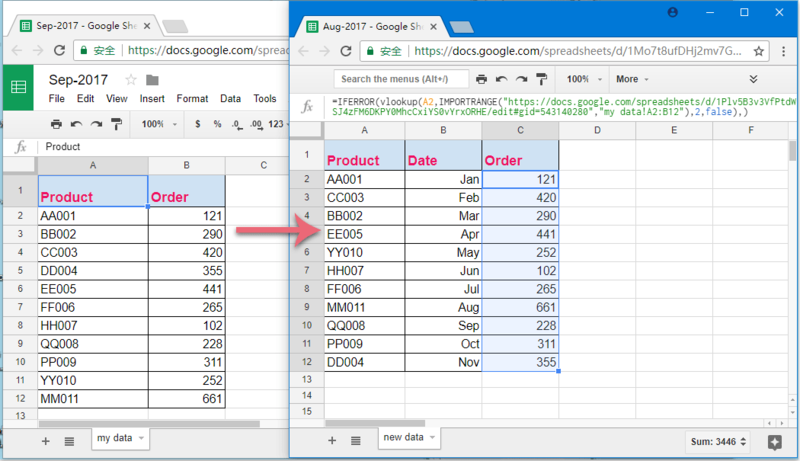 If not, you need to put formula "=importrange("link, range") in a blank cell first. Then you will have a pop-up window asking you to grant the access. Now, the full formula should work. I had exactly the same problem before and found this solution on another website. Hope it works. Good luck. Thank you so much. It worked for me too! This fixed it for me. Thank you so much! I was tinkering for hours.